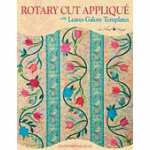 Learn how to use Pelland's time saving templates to make soft, beautiful, fusible applique quilts. Patterns included for five quilts from simple to complex. Color photos of these five patterns and many more inspiring quilts. 100 Pages.